Throughout human history, the sun and moon have held profound status and meaning. Both celestial bodies have been the source of much mythology and have had a huge role in humanity’s connection with the supernatural. Besides this, these astral bodies have served as guides for primitive peoples. Whether it be a solar clock to understand the time of day ,or moon phases to track passing weeks and months, these heavenly bodies have played a much needed role. To sailors, these giants in the sky were tools for navigation and understanding tidal tendencies. 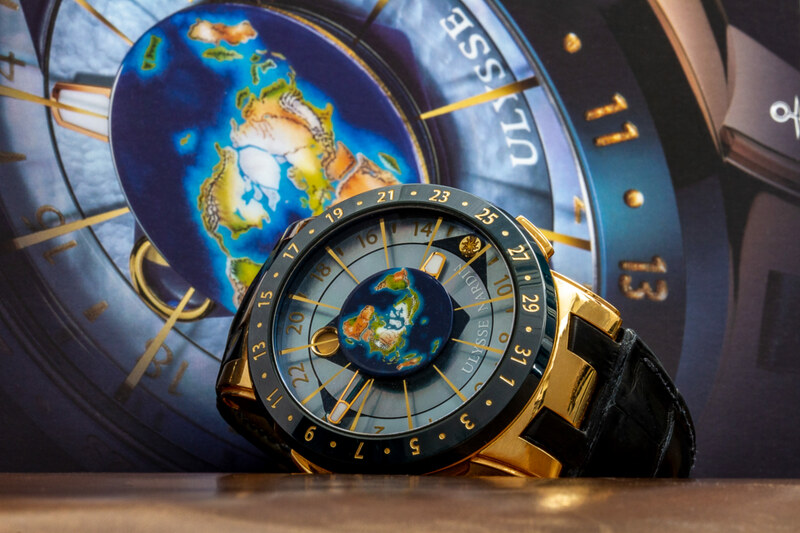 This is where Ulysse Nardin, a brand inspired by the sea, utilized the advancements in master watchmaking to create a masterpiece demonstrating the power of these astral entities. Unearth the power behind the Ulysse Nardin Moonstruck. 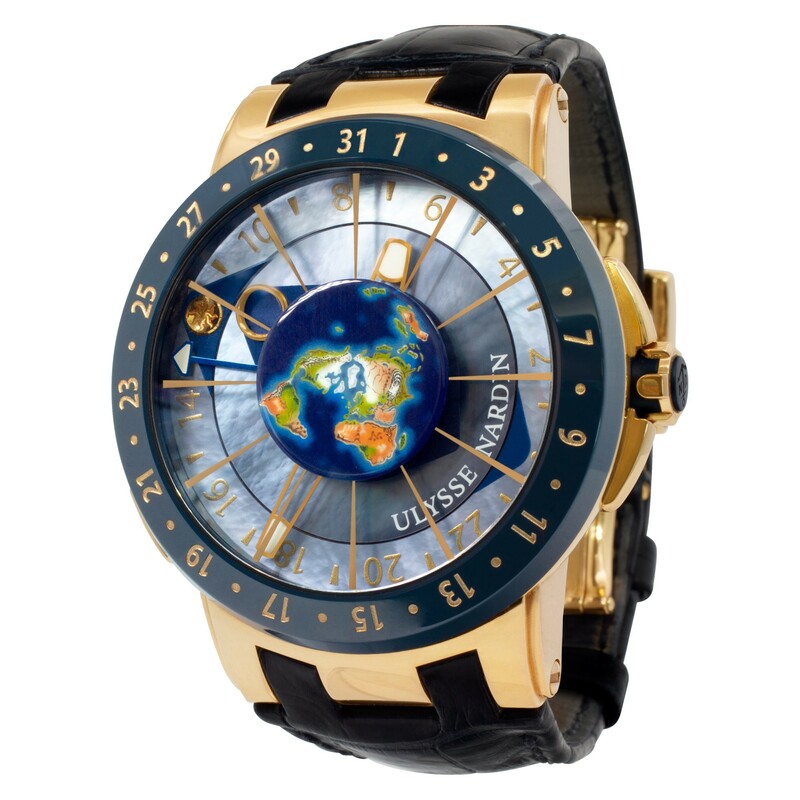 Ulysse Nardin is notorious in the watchmaking world for its grand achievements in terms of sophisticated wristwatches. The Moonstruck does not fall short of the company’s notoriety. From the initial glance, the watch features an intricate two-disc mother of pearl dial with 24 hour gold stick and Arabic numeral markers. The crystal is etched with a 12 hour gold stick index. At the center of the dial lies the center of it all, our small blue planet, the earth. The hands of the watch are skeletonized in gold with luminescent tips. The watch features a navy blue ceramic bezel etched with the date calendar in gold Arabic numerals and dot indicators. It is set in an 18k white or rose gold case on a navy blue crocodile strap. 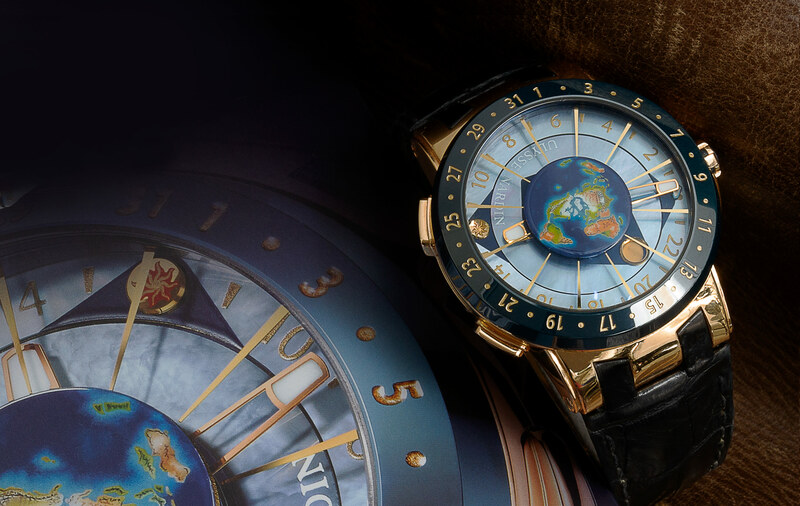 From a strict aesthetic perspective, this watch covered in different tones of gold, blue, navy, and combined with its geocentric perspective, inspires awe. The earth being center surrounded by the deep blue almost casts the same image as the view of our planet from the cosmos. A small blue planet in the deep and vastness of space. Even more fascinating than the beauty of this watch is the multiple complex functions it possesses. The ceramic bezel is etched with the date. It is indicated by the single long blue hand and can be changed by having the crown in position 1 which can be moved in either way as it is bidirectional. The outer mother of pearl disc is the sun disc. The position of the sun is designated by the rose gold marker. This disc indicates where the sun is in perspective to the earth. This disc also has the 24 hour index markers. The inner mother of pearl disc is the moon disc. This disc has two features as it indicates the location of the moon via the porthole while also demonstrates the phase the moon is currently in. The waning and waxing of the moon is shown in a blue or gold color; a full gold porthole being a full moon. 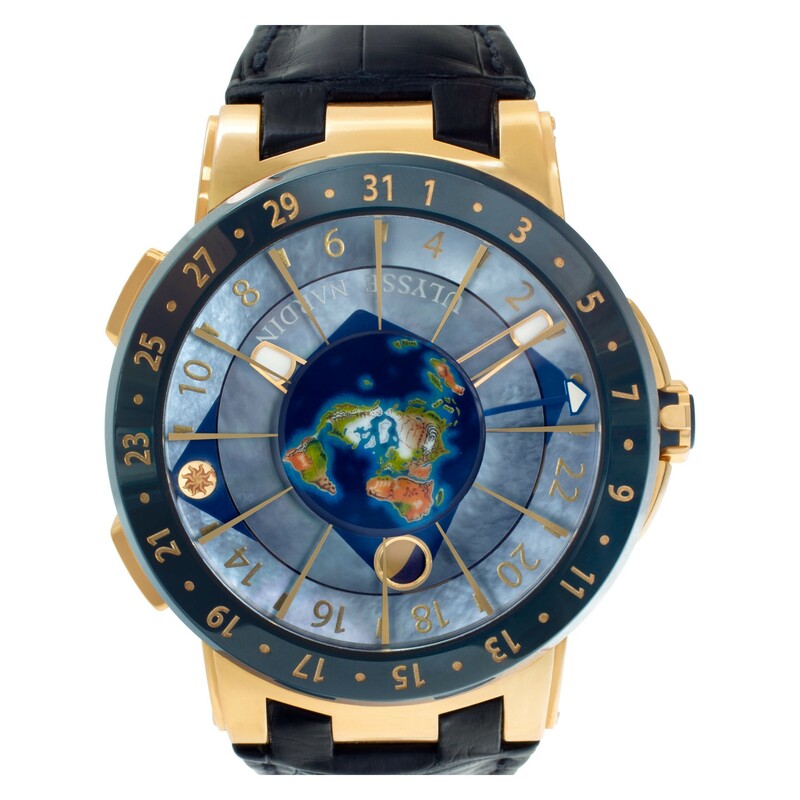 One of the most fascinating features of this watch is how it visually indicates one of the most significant effects the sun and moon have on the earth: the ocean tides. The gravitational pull of these astral bodies and their location makes a crucial impact on the tidal flow on our planet. When the moon and sun become aligned, this creates an effect known as the spring tide which makes the tide the highest it can be. When the sun and moon are at an angle of 90 degrees from each other, this creates a neap tide, making the tide come to its lowest. The spring and neap tide are designated by the dark navy triangles or “ rising waves” seen on each disc surrounding the astral body and the opposite end of the disc respectively. The perspective of the earth is from a top down view with the center being the north pole. The sun is permanently at the noon position, thus wherever it is surrounding the globe is noon and this feature allows for a rough estimate of the world time using the 24 hour indicators on the sun disc. The two buttons on the left side of the watch allow it to change the hour rapidly thus making this watch an ideal travel tool. With a 50 hour power reserve and 42 jewel movement, Ulysse Nardin spared no costs on the Moonstruck. This watch has both sophistication and beauty. It’s use of portraying the multiple motions occurring at any time gives one a multidimensional perspective on time transcending the simple view as just the time of day where one is. The brand managed to combine its image of inspiration by the sea with the astronomical complexities of the two most recognized astral bodies in human history and place all this into a 46mm by 46mm area fitting on a human wrist: a masterpiece.